But what can’t be masked is the persistent link between intensive animal agriculture and regular outbreaks of viral or bacterial pathogens that threaten human health. Whether it’s hamburger contaminated by E. coli, salmonella in chicken meat and eggs, or pfiesteria in Chesapeake Bay fish, there seems to be KFC (Killer Food Circulating) on a regular basis for decades, and little is being done about it. For all the flurry of worry over swine flu this week, let’s not forget that the Centers for Disease Control calculates that foodborne diseases kill approximately 5,000 Americans a year and sicken many more. Few of us in the animal protection community will be surprised to hear that the current swine flu outbreak that’s feverishly in the news was first detected in a Mexican village known for its stinky pig manure. The Times in London is reporting that the area in Veracruz where hogs are raised by the millions had a previous respiratory illness manifest itself a month ago. Residents of La Gloria have long complained about the stench and the flies near the hog farms’ huge manure pits but nothing has changed. Now that a possibly new strain of swine flu is out and about, the thought of a pandemic has everyone on alert, suspecting every sneeze and donning surgical masks. But what can’t be masked is the persistent link between intensive animal agriculture and regular outbreaks of viral or bacterial pathogens that threaten human health. Whether it’s hamburger contaminated by E. coli, salmonella in chicken meat and eggs, or pfiesteria in Chesapeake Bay fish, there seems to be KFC (Killer Food Circulating) on a regular basis for decades, and little is being done about it. For all the flurry of worry over swine flu this week, let’s not forget that the Centers for Disease Control calculates that foodborne diseases kill approximately 5,000 Americans a year and sicken many more. Add to that viruses related to farmed animals (which may contain genetic material from multiple species) and presto, you’ve got a contagion casserole. Remember SARS? Remember bird flu? Mad cow disease? They haven’t gone away. Whether they come from Asian markets, British pastures, or hog farms right here in the U.S.A. (paging North Carolina! ), the organisms that thrive in factory-farm conditions – huge concentrations of animals, poor sanitation and waste disposal, and the transport of animals over great distances from farm to feedlot to slaughterhouse – are going to continue to multiply and/or mutate in a food supply version of a shell game. Quick, find the “bug” that will make you sick! Whether it’s transmitted by animal-to-human contact or human-to-human contact (or both), the underlying causes are not being adequately addressed either by world health organizations or by the individual agriculture agencies that could better regulate factory farming and don’t. Why? I believe it’s because the global demand for meat products trumps all other interests, at least until it’s you or someone you love lying in a hospital bed hoping to heaven that there’s a pill or a shot that will save you. Prevention? Not when you’re talking about a global industry that couldn’t achieve the profits it does without a farming model that relies on maximum production and minimal oversight. And the public, whose collective appetite creates the demand for all that supply? Suggesting that individuals cut back or eliminate meat in their diets is considered radical and unthinkable. “Become vegetarian,” we suggest. 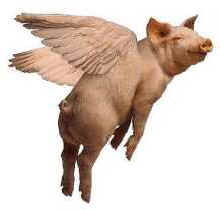 “When pigs fly!”, they reply. Who among us hasn’t had this conversation? And then the swine flu headlines pop up, and we feel vindication mixed with anger and frustration because we’ve seen this before and know we will again so long as the status quo remains. I wish pigs could fly. I wish cows could fly. Heck, I wish most chickens and turkeys could fly (poor genetically altered souls). If they could, it would help all of us escape this mess.